I’m always on the lookout for interesting flavor combinations, especially if I have all the ingredients at the ready. 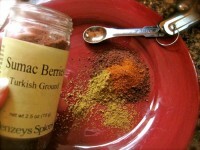 I’ve got a spice jar with ground sumac berries I’d like to use. This is a marvelous lemony seasoning, commonly used in Turkish cuisine, but I’ve only used it when making the traditional tomato pita salad, fattoush. When I saw a recipe on the Citron et Vanille blog using ground sumac to season chicken, it was a done deal. 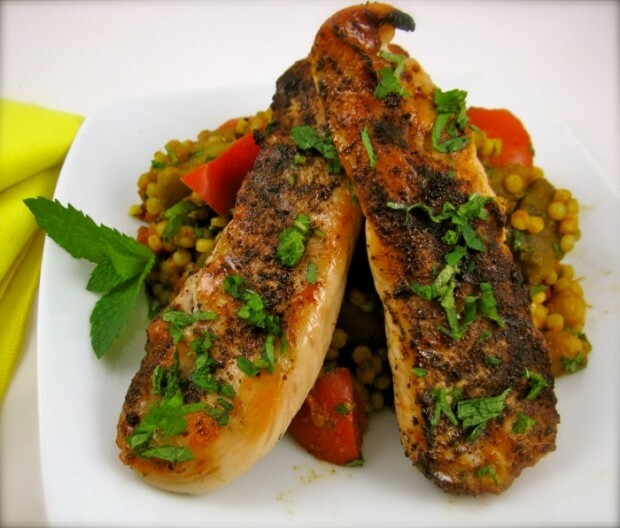 The chicken was served over Curried Israeli Couscous, another recipe I adapted from this terrific food blog. Recipe adapted from Citron et Vanille blog. Lightly season chicken strips or tenders with kosher salt and cayenne. Whisk together sumac, lemon juice, olive oil and cumin powder; marinate in mixture 2-3 hours.